Pure Style Home: It's Out!!! 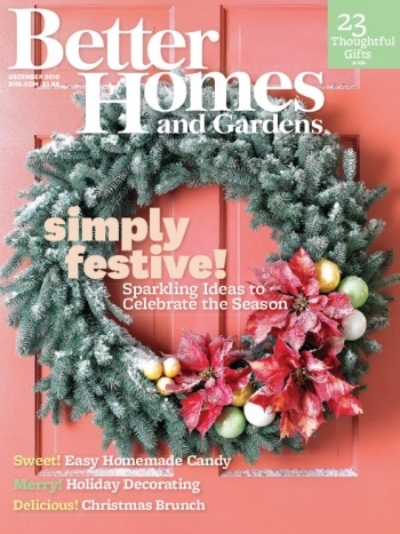 The December issue of Better Homes & Gardens magazine featuring our home is out on newstands!!! I was also chosen as the blogger of the month and am on one of the earlier pages for that. I fell in love with the other homes featured in it and they all have a fresh, natural feeling that I love. Thank you so much to everyone at BHG, especially, Joanna Lingberg, Jessica Thomas, Helen Norman, F.J. Hughes and Shelley Caldwell. This has been a dream of mine & I can't thank you enough for making it such a fun & meaningful experience. When December arrives, I'll share some of the cool behind-the-scenes/ how-to's from the shoot. Congratulations! That's so exciting. I am going to have to pick up a copy! How exciting!!!! I can't wait to see! Oh why is it not in my mailbox yet! Soooo exciting for you! I can not wait to get my BHG in the mail now. Congratulations! I can't wait to see it...my issue hasn't arrived yet. Congrats! Can't wait to see it! Hope you and your family do something fun to celebrate!! Very exciting! Congratulations Lauren! That is super exciting- can't wait to get my copy!! * Gee, Ms. Movie Star... NO, make that "DESIGN STAR"(!)... pretty soon you'll have people standing in lines to get YOUR AUTOGRAPH on your LATEST BOOK!!! SOOOOO happy for you and, even tho I'm not your Mom, I'm PROUD of you like a Mom is! I'm THRILLED for you! I will definitely look for mag this week. I actually have a photographer coming here on Austin for photos for my website....so, I'm looking forward to the fun on Friday! Lauren, yay, congratulations!!! I am so excited for you!!! Oh, how exciting!! Cannot wait to get it and see your lovely house and imagine it has transformed since then but will be so amazing to see all the styling and flowers and such (which you also do beautifully!!!). Congrats! Congratulations!! I'll definitely be picking up a copy of this--you're AMAZING!!! Yay!! On my way to get a copy. Can't wait. Congratulations! Can't wait to see it!! Fantastic! I can't wait to see, going out to pick up a copy today. I'm sure it's amazing. Congratulations!! Congrat's Lauren...you know I am running out to get this issue now! Cannot wait to see our lovely home! All the best on this exciting day! Can't wait to see this issue. Congratulations Lauren!! Can't wait to pick it up!!! this is SO exciting! running off to the newstands pronto. looking forward to all the "behind the scenes" posts! I will run out today! Can't wait for mine to arrive! Yay! I feel like I've been waiting forever for this issue to come out. Coming out of lurkdom to congratulate you on the spread! Mine arrived in the mailbox on Saturday and I was so excited to see it and feel like I knew you! Congrats! Congratulations!! We're so excited for you! This is amazing! Awesome! Can't wait to see. Huge congrats! Congratulations Lauren!! Will you post the article on your blog? Because I will not find the magazine here in Belgium! Can't wait to see!!! Awesome Lauren...I am so happy for you!!!! I am going to B&N to get myself a copy today..can't wait! can't wait to go get my copy!!! I can't wait to pick up an issue, congratulations Lauren, how exciting for you! You must be so thrilled! Congrats! Gonna run to get it!!! i was at the store and looked at it today!!! Wow! Congrats! I've been a huge fan of yours for a while now, and just started my own (super amateur) blog. Can't wait to check out your BHG spread! Congratulations!!!! That would be so exciting! Congratulations! I've been following your blog for a few months and it is well deserved! Congratulations, Lauren! How fun and exciting. Well deserved. So exciting, congratulations! Look forward to seeing it! Lauren I bought one yesterday and your spread is FABULOUS!! I am so excited and thrilled for you - darling family, gorgeous home...you go girl! Lauren, I am so excited for you! What an honor!!! I can not wait to see it! I just received my copy in the mail and turned to your article first....lovely! Congratulations! Pure Style Jealousy! so great -- congratulations. Will pick up a copy tonight. Just got mine out of the mailbox- going to check it out now! Congrats again!!!! A very big congrats to you and your fab house!!! Wow! Wow! Wow! So exciting! I am buying a copy tomorrow since mine has not arrived yet. Congratulations Lauren!! I cant wait to see the article! So thrilled for you!! I will be checking my mailbox everyday. I can't wait until it arrives so I can see your story. I might just have to take a sneak peak at the grocery store if it does not get here soon. Congrats! You are so deserving of that spread, girl! So happy for you. Congratulations, can't wait to see! You should have been on the cover! Can't wait to get mine in the mail! Congratulations - well deserved recognition. F A N T A S T I C ... i will run and buy it tomorrow!!! congratulations sweetie... you so deserve this... all of it! Congratulations! I live in the UK and unable to receive this edition. Will you be posting the pages in a post? While grocery shopping this morning I remembered to get BH&G---your feature is beautiful. I'm so happy for you that even more people will see your talent and lovely family. How exciting! I got my issue in the mail last week but I haven't had a chance to look at it yet - after seeing this I'm running to grab it! I'm in the process or pepping up my home. I loved your ideas in BH and G. Your house and family are adorable! I love the positive, cheery feeling on your blog. I just saw it and realized that I had been to your blog! I definitely tore out the page with your brilliant orange door, that beautiful hefty wreath and those DaVinci prints. great shot. I remembered & picked it up Sunday night. Your home looks gorgeous. Your kiddos couldn't be any more precious. Can't wait to see the portfolio pics. Our issue arrived in the mail yesterday afternoon, I quickly ripped off the plastic cover to find the article. Every shot picture perfect! My favorite though is the precious family photo. Congratulations and hugs. YEAH!! I cant WAIT to get my hands on a copy to see your beautiful home!!! WOOHOOO!! I'm SO EXICTED for you Lauren!!!!! Running to the store to grab a copy!!!! YAY!!! Hip, hip, hooray! Can't wait to see your home all decked out for the holidays. Huge congrats Lauren!!!!! No one deserves it more. I can't wait to see the article!!! Brava! Congratulations! I got my copy. Your home is beautiful and your little kiddos so cute. Picked up my copy today!!! Soooo cool! You, the fam, the house look perfect! Congrats! Congrats sweetie, I am going to go and get mine right now!!! Yippee!! My copy just arrived in the mail! Can't wait to sit down somewhere cozy and read all about you. I love what they've done with this magazine. So hip. So inspirational. Congratulations Lauren!! What well deserved press. I've never commented on your blog before but I've been a follower for over a year now and just wanted to let you know that I really enjoyed reading the Christmas article about you in BHG this month. Also, congrats on being it in. Got my copy yesterday. Such a nice article! Your talent shows. That is how I found your blog.